If I lived in Toronto’s Ward 7, I’d find it really hard to vote for incumbent Coun. Giorgio Mammoliti. That’s not only because he recently had his council pay suspended for three months after holding an improper fundraiser where he seemingly accepted money from city lobbyists, but also because Mammoliti has always seemed more interested in grandstanding than discussing city policy. Whether it’s whipping his shirt off at city hall to protest a clothing-optional beach, creepily filming the Dyke March at Pride in a supposed hunt for hate speech or offering the baseless suggestion that the city could raise a half-billion dollars by acquiring a giant floating casino boat, he’s just never struck me as a guy who takes the business of running the city all that seriously. Watching last week’s Ward 7 candidates debate on Rogers TV didn’t do much to change that notion. Matched up against seven of his challengers, Mammoliti was on the defensive but generally stuck to a script of taking credit for ward successes and blaming others for local problems. That prompted a long digression about massage parlours, of which some candidates agreed there are many. “You name me one square block where you can’t find five massage parlours in Ward 7. You can’t, can you?” asked candidate Chris MacDonald, presumably rhetorically. 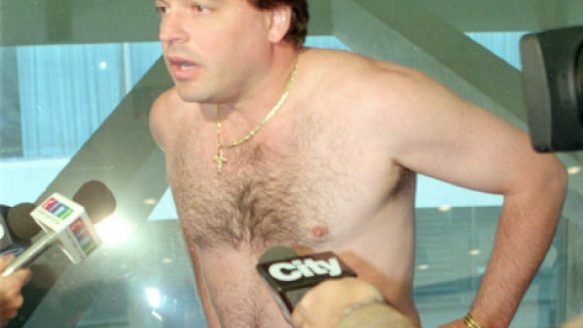 Nick Di Nizio, challenging Mammoliti again after losing to him in the 2010 race by 1,737 votes, pointed out that Mammoliti’s talk about public safety rings a bit hollow, given some of his past comments. That thing about Mammoliti claiming 80 per cent of transit riders don’t pay their fares? True story. Throughout the debate, it was candidate Keegan Henry-Mathieu who most impressed, offering a new hope for the ward. On the issue of public safety, the former chair of the Toronto Youth Cabinet scored points by eloquently defending the role community programs play in reducing crime. “The reality is that there is no reliable study around the world that can prove that policing will reduce crime,” he said. “It is much more complex than that. We need a holistic approach.” He pointed to Mammoliti's voting record on things like the Community Partnership and Investment Program, stressing the need to engage communities. Henry-Mathieu was also strong on the issue of transit, emphasizing the importance of going forward with the Finch West LRT. The rest of the candidates were split on the LRT. Harp Brar wanted to talk about elevating the line. Chambers backed the LRT, saying the subway was way too expensive for Ward 7. Di Nizio acknowledged that the LRT was inevitable, but said he would push for a study on burying a section between Highway 400 and Islington Avenue. Chris MacDonald wanted to bury the whole thing. And candidates Larry Perlman and Scott Aitchison didn't seem to want responsibility for making transit decisions at all, speaking of the need to pass transit governance on to Metrolinx. Mammoliti, for his part, lobbied hard for a Finch subway, misrepresenting the speed of the LRT. He explained that the LRT would travel at just 19 km/h, whereas existing buses move at 27 km/h. But page 23 of the very same engineering report Mammoliti cited in the debate suggests that, in the area it studies, the bus currently averages between 14 and 17 km/h, whereas the LRT will average between 21 and 24 km/h. When Henry-Mathieu and Di Nizio suggested Mammoliti had flip-flopped on the LRT, going from an enthusiastic supporter under Mayor David Miller to a virulent detractor under Mayor Rob Ford, Mammoliti blamed the provincial government. But there’s no indication that the provincial government decided unilaterally to change the projected operating speed of the Finch LRT. There’s no indication that the speed ever changed at all. Not surprisingly, when asked a question about the divisiveness of council toward the end of the debate, several candidates — including Di Nizio and Henry-Mathieu — stated their support for council term limits. Between his time as an MPP and then as a councillor, Mammoliti has represented York West for 24 years.